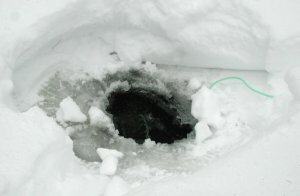 A couple of sites (watergardening.infopop.net and gardenweb.com) added links to the pondcam. I decided that it was about time to improve the link counting script. The new version collapses and summarizes the list rather better. It also allows you to see just the top 40 referring sites. Remarkably, a bunch of sites just link to a single image, namely hole.jpg. I suspect that Google image search is the way that they found it, but currently for the search 'hole' it doesn't show up till the second page. I've finally added the links to allow people to see the streaming video from the pond. See: Windows Media (100k), Windows Media (40k), RealVideo (100k), RealVideo (40k). I've limited the outgoing bandwidth to 300k so you may get a 'busy' page sometimes. Last week, during the very hot weather, two of my Golden Orfes died. I don't know whether the heat got to them, or they were chased by the other fish, or what, but I found them floating amongst the plants. The other two orfes survivied. The pond temperature reached 92F during this time. I'm not quite sure how to limit it -- maybe I could add cold water. You can see from this graph that adding cold water does have a noticeable effect. The reduction is (obviously) much larger when the water temperature is higher. Argh! This evening, I observed a four inch goldfish with half a salamander hanging out of its mouth. This rather suprised me as I assumed that the goldfish wouldn't go after anything that big (the salamander was probably three inches before it got munched). I had added the salamanders to the pond last fall when a friend gave me a bunch that he had rescued from his swimming pool filter. Until today, I hadn't seen any, and now I think that ignorance of their fate was probably bliss. I am fiddling with the pondcam -- it is back in the water but I am trying to get a good picture. So, for the next few days the picture may be at a funny angle or similar. I am also experimenting with streaming better video, but I have not yet found a solution for netscape and IE that doesn't cause problems in (at least) one environment. I wish browsers and plugins were more compatible! Update: For IE running with WMP7, you will now get a stream at a good frame rate. The bad news is that it doesn't work well over a slow line (unless you have your WMP preferences set to correctly specify your connection speed). I ordered a bunch of plants from World Plants out in Oregon. I received a Juncus Filiformus for the pond, and various other small plants. However, the real motive was to get a Gunnera Manicata. I admit that I am suffering from a severe case of zonal denial, but I felt that if I put it in a large pot, and stuck it in the basement / garage over the winter, then it ought to survive. It currently has four leaves, the largest is under a foot across. In a fit of madness, I potted it up in Miracle Grow -- the stuff that is supposed to double the size of plants. We shall see! I also got a Ginkgo Biloba Tree. This should survive the local climate, and will make an interesting addition to the regular garden. I have no affiliation with these guys, except as a satisfied customer. I ordered an Egyptian Papyrus from The Watergarden Shop along with some other supplies. Two plants arrived remarkably quickly and are now already sending up new shoots. Of course, I'm not following the instructions on planting, but if it gets as big as they claim, then I'll have to repot it. I also ordered Super Clear from them to try and clear up the murky water. I was suspicious of the bottle which said 'results within 24 hours'. However, within 24 hours the water was distinctly clearer. I don't know whether to accord credit to this stuff, or whether the filter/waterfall combination got their act together. The only failure was some floating plants that the fish promptly ate.